In case you haven't noticed, I'm posting about my older costumes in 100% random order. I will happily take suggestions for what to feature next. I'm saving all my really embarrassing things for Throwback Thursdays and Ghetto Fridays though! Anyway, today's post is about the Striped Monstrosity. Aw, 2010. The year of my intense 1850s obsession. 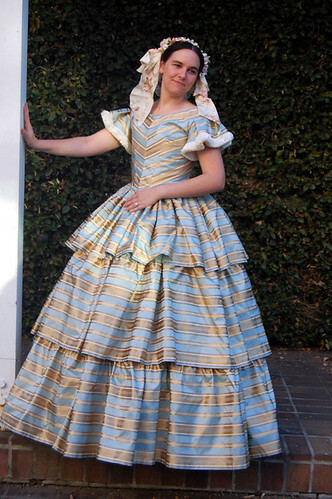 I blame this dress, but more specifically, I blame this fabric and Katherine of The Fashionable Past. This fabric is the fabric dreams are made of. If this fabric was a person, I'd take it to Vegas and marry it. 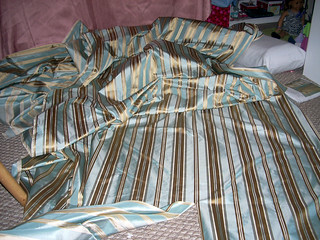 It's a light blue silk taffeta with gold satin stripes and Katherine made me buy it in the fabric district in 2009. It cried out to be a fluffy cupcake dress. Seriously cutting into this felt like a betrayal. 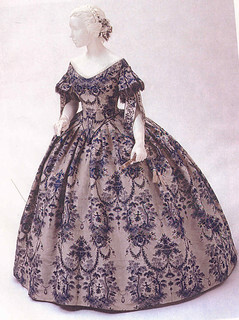 My main inspiration for the skirt was this fashion plate, with sleeves and bodice from an extant dress in the Philadelphia Museum of Art. 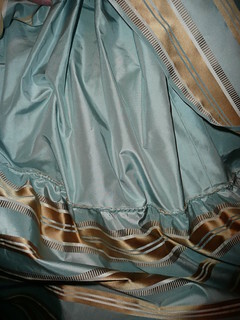 I made a foundational skirt out of plain blue taffeta and marked where I wanted my flounces using tailor's chalk. 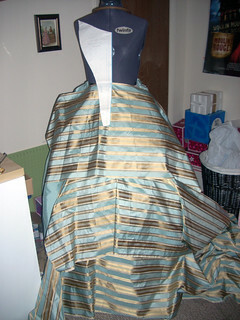 I then cut along the stripes to make three flounces. Each of those flounces is hemmed by hand, as is the foundational skirt even though NO ONE would ever see that hem. I feel that this dress alone redeems all my Ghetto Friday projects. I also ran a channel with a cord (by hand!) 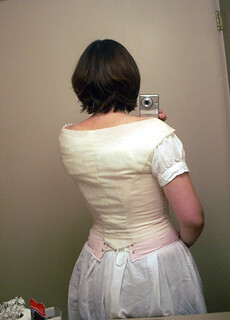 along the top of the bottom two flounces to gather up to fit the foundational skirt. 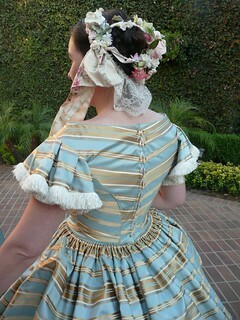 Luckily, my friends talked me out of attaching the flounces to the skirt by hand, though it was a close thing. 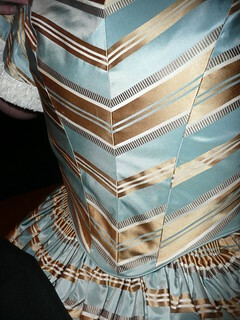 The top flounce was cartridge pleated with the top of the skirt onto the waistband. 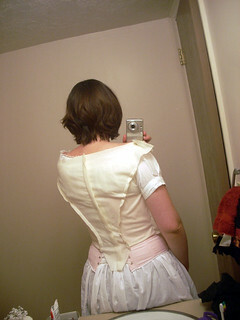 It took two tries to get the bodice right because I was being uncharacteristically fussy about it. 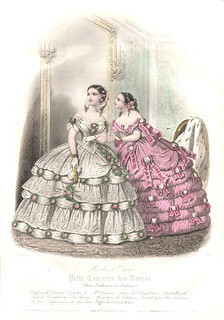 The first draft was from an aborted attempt at the Huge Pink Ballgown and was terrible because that dress is cursed. Aw yiss! Look at that barely restrained smirk at the perfection of my fit. So of course I had to obsessively place my pattern pieces in order to deliberately place my stripes. Because I went temporarily insane. I blame Katherine, because it was clearly her influence. 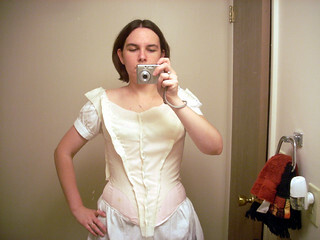 That piping on the bodice? 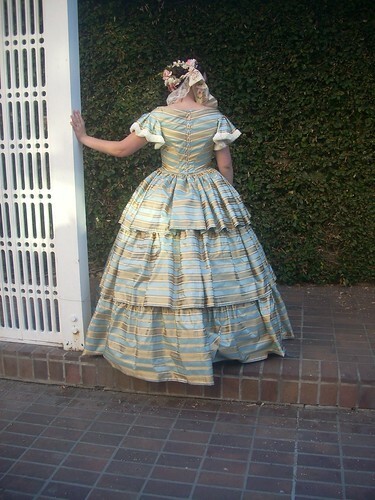 Hand made from the skirt taffeta and yarn. No big deal. 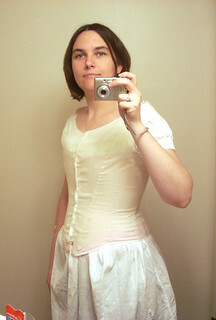 Of course, I went to Costume College without finishing the eyelets, so this was a thing that happened. To tie the whole thing together, I bought a headdress from Mela Hoyt-Heydon in the marketplace. I was very excited about it. So there you have it. The Striped Monstrosity was my giant cupcake dress and I love it still. Someday I will find another place to wear it. Great fabric! I love the sleeves in particular. Is that fringe on the edge? What sort? It looks very thick and luxurious. Did you line the inside of the sleeves? In one picture I think I can see a bit of white lining showing. That fabric is indeed delicious, and the gown turned out BEAUTIFULLY. This is so gorgeous. 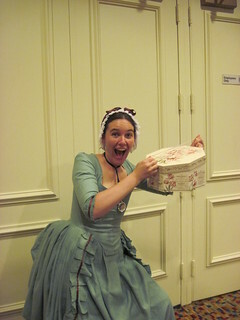 It makes me want to schedule a tea party for my daughter where everyone dresses up! Oh what fun!! I love this stripey cupcake dress! And your matchy matchy stripes! Laaaaa!! Perfection! Most excellently made my dear! This is still one of the most amazing dresses ever! I think its the look of smug satisfaction on your face in every picture that really makes the dress perfection.